I have a set of 5 lb dumbbells and a 5 lb medicine ball that I used to do bicep curls, tricep extensions, chest flies, and 2 other exercises I don't know the proper names of. 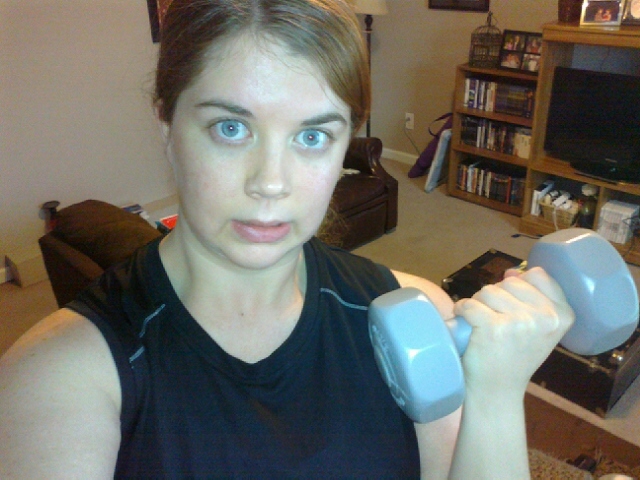 I also did 3 sets of 15 squats, calf raises, push-ups (mostly on knees), and crunches. I did this for 25 minutes. Drank 1 cup water. Found this one on Pinterest last night. 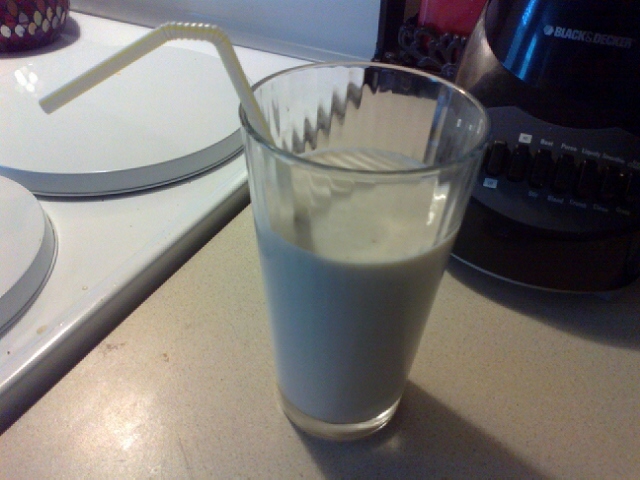 A peanut butter and banana smoothie: 1 frozen banana, 1 tbsp peanut butter, 1 heaping spoonful of plain nonfat Greek yogurt, and 1 cup fat free milk. Amazing. It reminded me of childhood memories, when my parents would randomly take us to Sonic "late" at night (like 8:00), and I'd get a peanut butter milkshake. This smoothie really did taste like a dessert. Of course, I guess it kinda should. The thing is around 300 calories. 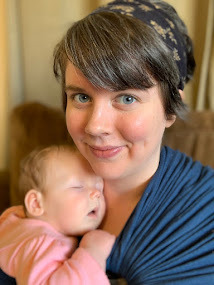 Just noticed it kind of looks like I'm crying in that picture. Go figure. 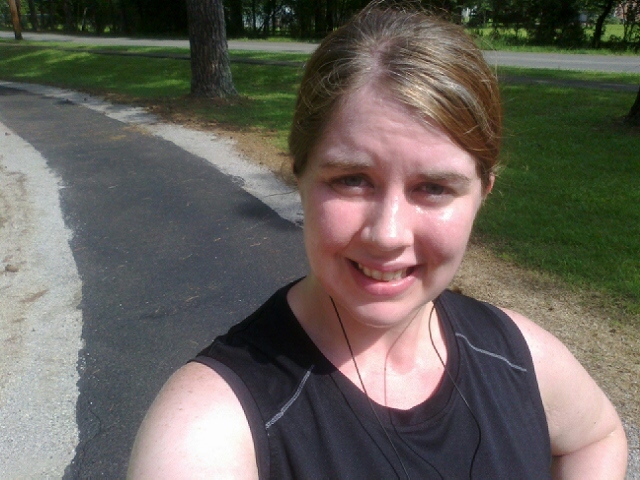 Went to the park again and ran with occasional 1-2 minute walking breaks for 40 minutes. Then I just walked for a little over 20 minutes, making it a total of 60+ minutes cardio. May I add this was in the sweltering summer heat? Today was SO humid. Needed a major shower after this one. I had sweat dripping off my forearms. I didn't even know you could sweat there. Gross. I got in 3 more cups of water. 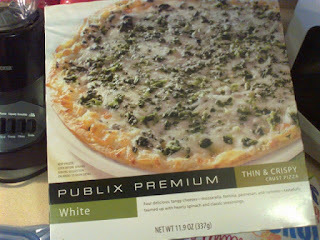 Found this on sale at Publix. 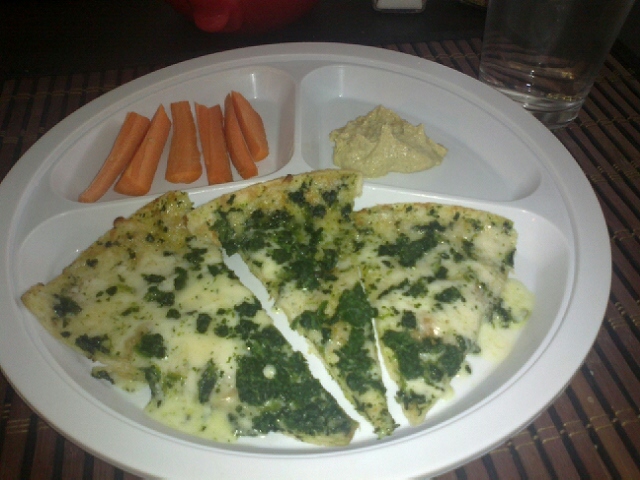 White pizza: four cheeses and spinach. 1 serving is an entire 1/3 of the pizza, and it's only 290 calories. It was delicious!!! I had a few carrot sticks (maybe 15 calories?) 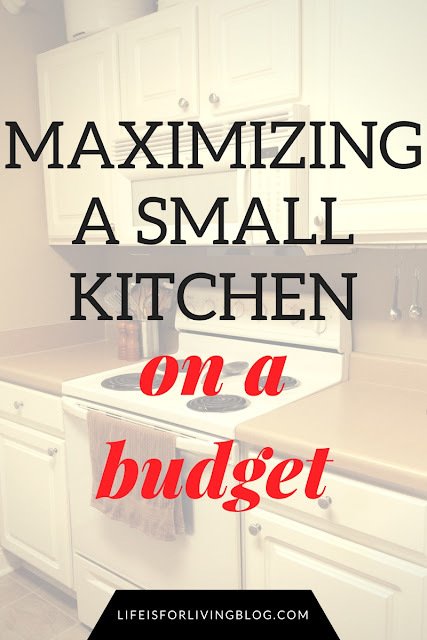 and a tablespoon of hummus (40 cal) on the side. 2 more cups of water. 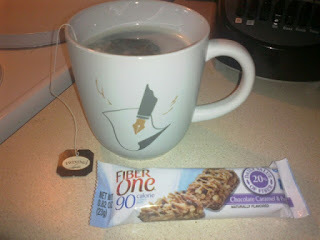 A cup of China Oolong tea with stevia in my inspirational writin' mug and a 90 calorie Fiber One bar. Taco night! Cilantro lime shrimp on a low-carb tortilla with spinach, tomato, green onions, monterey jack, and a teensy bit of fat free sour cream. 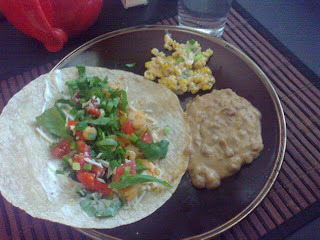 Side of roasted Mexican-street-style corn and mashed pintos with fat free sour cream, taco sauce, and shredded cheddar. Om nom nom! 2 more cups of water. Yep. Barely an hour after dinner, I got the munchies. 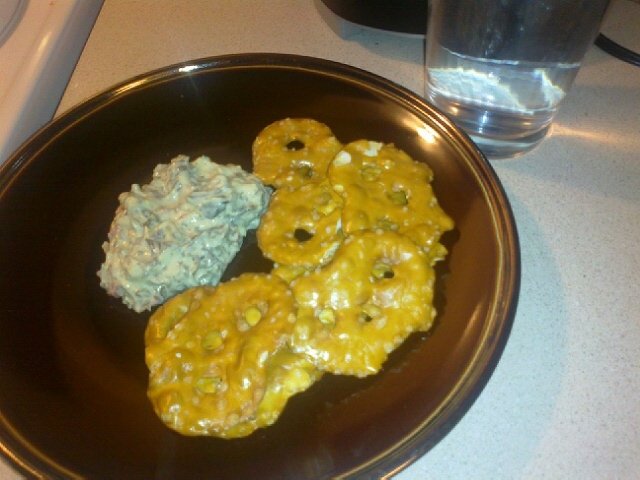 I had 1 serving of original Pretzel Crisps and 2 tbsp Tostitos spinach artichoke dip (only 50 calories). Another cup of water. I was really hoping I wouldn't need a post-dinner snack today. But there you go. Even though it's a little early, I'm gonna go ahead and brush my teeth. That's a little trick I heard somewhere. If you want to stop eating, go brush your teeth with minty toothpaste and rinse with Listerine. Nothing will taste good. So, how was your day? Did you meet any personal goals you set for yourself? The week is halfway through. End it strong! Now I'm always hungry when I read your blog. haha. I didn't set any goals yesterday. BUT I do have a goal for tomorrow... I'm going to force myself to get up early even though it's my day off and go for a long walk/run! I can't wait. That taco was tastyyyy! And that pizza was a great find. Only 5.50 too! And it was my lunch for two days and yours for one also. What a deal! You are doing "fantastic"! little shout out to nine. Uh oh. That's not good. Sorry about that! Hopefully, you're at least only hungry for vegetables, lol. I can't wait to hear how your walk/run goes! That'll take some real determination, getting up early when you could be sleeping in. But it'll be great to go ahead and get it over with first thing. Good luck! Thanks! I found that taco quite delicious too! And that pizza... mmmmm. I'm so glad you're a Whovian now. Whovians are cool.